Group travel and strangers as roommates: What's it really like? "Group travel" is sometimes used as a dirty word, conjuring visions of crowded tour buses, faceless tour guides and rigidly scheduled itineraries. The idea can also sound intimidating to a solo traveler who assumes that everyone else will show up with a partner. Plus, what are the chances that you'll even like any of those people? In our experience, it turns out that chances are pretty darn high. When you find the right niche (like, you know, running), group travel is an amazing way to connect and quickly bond with like-minded people. It also allows you to access incredible places and experiences without having to waste time and energy on the logistics which, for those with a job and perhaps a family too, is a big deal. And as far as those solo traveler fears go, forget them: the vast majority of our runners show up knowing absolutely no one (though within the first few hours that all changes!). But, we know you'd rather hear from the people who go on the trips, not the people who create the trips. So we've interviewed two RE alum who joined us - solo! - in Morocco a few years ago. Cepee and Annette each brought along varying levels of travel experience and running ability, and both had reservations about traveling with a group. Read to find out about their pre-trip worries, on-trip experiences and their enduring post-trip friendship (and business!). Describe your general travel experience prior to your RE trip. Had you done any group travel before? CEPEE: In 2014 I joined Rogue Expeditions on their trip to Morocco; I was 34 years old and had been to Morocco twice already. I started traveling abroad when I was 17 and had mostly traveled on my own before joining their trip. I have always enjoyed the freedom and benefits that solo travel provide. It’s perfect for slow travel, you can create your own itineraries and immerse yourself into local culture very quickly. For me, group travel always appeared to cover too much ground too quickly, was overpriced, and focused more on sightseeing than cultural immersion. Some of the places I had visited were the Netherlands, Germany, Switzerland, Spain, England, Italy, Mexico, Argentina, Czech Republic, Iran, U.A.E, Turkey, Portugal, Israel, Palestine, Jordan, Egypt, Canada, Colombia, Austria, Belgium, and Iceland. ANNETTE: My travel resume at that time was filled with vacations through North America, Europe and Caribbean. Not too shabby… I mainly traveled by myself or with 1-2 others, meeting up in different locations. On occasion, I experienced traveling with small groups of 5 for those birthday/wedding trips. When you registered for Run Morocco, did you know anyone else in the group? 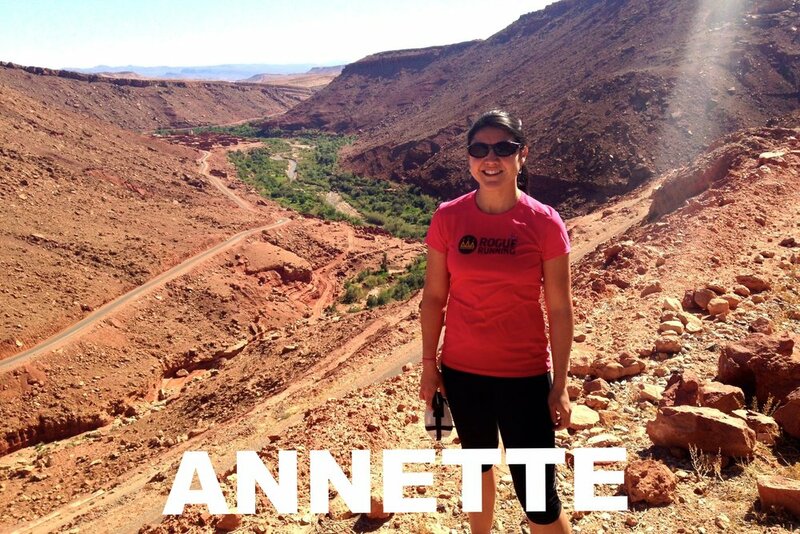 ANNETTE: When I signed up, I thought surely I'll know someone in the group since I had been running with the Rogue community for a couple of years. At the first meeting, I quickly recognized no one! I knew Allison as a running coach for Rogue yet I had little interaction with her. But I felt confident having her there, a familiar face. CEPEE: I didn’t know a single soul before signing up! Did you have any hesitations about a group tour? CEPEE: Not really. Although I had never been on a group tour and was very anti-group, I was still drawn to the opportunity because it seemed different from the standard group tour experience. I had never heard of the combination of running + travel and figured the type of people this trip would attract would be unique, not the standard motorcoach group tour crowd. ANNETTE: I did have some reservations about traveling with a big group: would we be a target? Would we get along? Can I stand to be in a group for 10 days straight and not go off on my own? Should I be at anyone's running pace? Once I met everyone, I felt an ease knowing that we all had the same worries. What ultimately convinced you to take the plunge? CEPEE: It was a combination of recently falling in love with running and the opportunity to combine that with travel, the trip falling on my birthday, the affordable price, and some personal reasons that pushed me to Morocco. ANNETTE: At that point in my life, I was looking to flip it upside down and get out of my comfort zone. I was looking for a different type of adventure and country than just visiting the typical cities or beaches. I wanted to be active through my travels and experience a new culture at the same time. I had never been that far from home or run so many miles in a week. Were there any surprises (good or bad) about traveling and running with a group of different backgrounds and ability levels? ANNETTE: I was elated to find out that we were not expected to run at the athlete/co-founders level! We had all abilities ranging from walking, trekking to speedy athletes. Everyone was so encouraging with each other; I ran or walked at least once with everyone in the group. I do recall thinking at the end of the trip that I didn't once worry or think about our security or safety. When you travel, that is clearly something constantly on your mind! Ahhh! One bad surprise was when majority of the group got sick with a 12 hr stomach bug; thankfully I did not nor did my roommates! One of the most special moments was bringing the school kids clothing and supplies; seeing their faces light up with glee made me happier than them! I did meet 3 women on the trip who happened to work for the same company I did. We had a special and unique group that made for the most fun adventure! CEPEE: When you put a bunch of strangers together and place them outside their comfort zone you never quite know how the group dynamics will work. I was surprised by how well everyone got along, by the different ages, varied backgrounds, and running abilities. Given that each run is supported, all runners can enjoy each day, you can do a few miles, a full marathon, or take the day off if you need to. However, the excitement of running through Morocco pushed us all to run more than we expected; I think we really surprised ourselves! I was also surprised by the amount of fun we had. There were so many inside jokes made on that trip that still crack me up to this day when I think about them. I imagined that I would be exhausted by the daily mileage and that there wouldn’t be much energy left for socializing, but that couldn’t be further from the truth. I enjoyed the random opportunities to connect with everyone, especially the long group dinners. You two were placed as roommates, but were strangers going into it. How was that? ANNETTE: I was asked by the RE crew if I would be okay rooming with two other ladies around my age throughout the trip. I thought sure, why not, what could possibly go wrong? I briefly spoke to both ladies at the meet ups but barely remembered their names. Fast forward to the trip… Literally on the first night, Emily, Cepee and I created an incredible bond; we shared our personal stories, found how similar we were and why we were on this trip. Any pre-trip nerves or notions were eased; I met new, long-life friends and we are now known as the "3 Marias." Placing three people in a room may sound like a nightmare, but for us it was an adventure. Hats off to the camp counselor for taking the risk! CEPEE: I was placed with two other solo female travelers in a triple room. We bonded quickly on the first night of the trip. One of my roommates was Annette and has become one of my closest friends, travel buddy (we’ve traveled abroad together every years since Morocco), and now co-founder of our online community She Hit Refresh (see below)! Since meeting in Morocco, Cepee and Annette have become the co-founders of an online community that was born out of their combined life and travel experience. She Hit Refresh is a community for women 30 years and older who want to break free from a life of routine and start a life of travel. If you've got even the slightest case of wanderlust, check it out for a serious dose of practical, real-world tips and inspiration. Then, once inspired, take a look at Run Morocco, our longest-running and most popular running adventure.